BARRON, Wis. — A man accused of kidnapping a 13-year-old Wisconsin girl, killing her parents and holding her captive in a cabin for three months is expected to enter a formal plea Wednesday when he appears in court for an arraignment. Jake Patterson, 21, wrote in a letter to Minneapolis’ KARE-TV this month that he intends to plead guilty. His attorneys have not returned repeated messages seeking to confirm that he will do so at the arraignment in western Wisconsin. Prosecutors have said they won’t comment. Such hearings are typically procedural affairs, where charges are read to a defendant who enters a formal plea ahead of trial. Sometimes a judge enters a not-guilty plea on the person’s behalf. 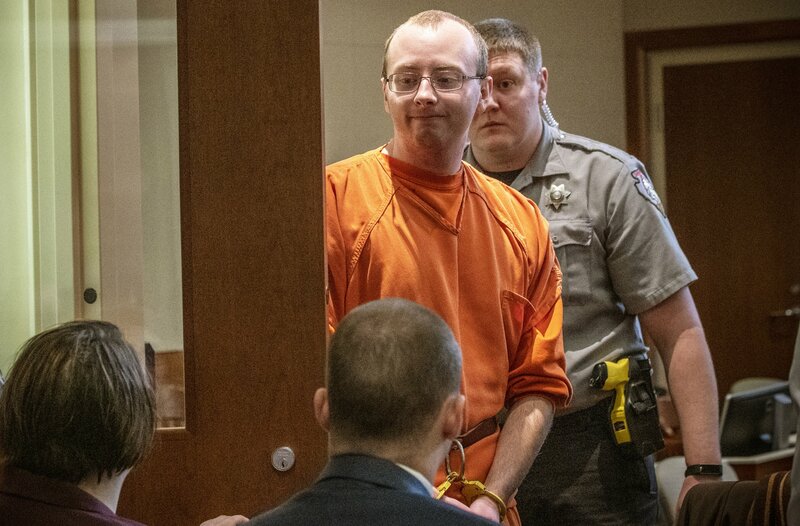 Patterson told authorities that he decided “to take” Jayme Closs after seeing her getting on a school bus near her home, a criminal complaint says. He’s accused of killing her parents, James and Denise Closs on Oct. 15 at the family home near Barron, about 90 miles (145 kilometers) northeast of Minneapolis. He then allegedly threw Jayme into the trunk of his car and drove to a remote cabin, where authorities say he held her for 88 days until she escaped Jan. 10. Patterson is charged with two counts of intentional homicide and one count each of kidnapping and armed burglary. He faces life in prison if convicted on the homicide counts. Jayme told police that the night she was abducted, she was asleep in her room when the family dog started barking, the criminal complaint says. She woke her parents as a car came up the driveway. She and her mother hid in the bathroom, clutching one another in the bathtub with the shower curtain pulled shut. They heard Jayme’s father get shot as he went to the front door. Patterson then found Jayme. He told detectives he wrapped tape around her mouth and head, taped her hands behind her back and taped her ankles together, then shot her mother in the head. During her time in captivity, Patterson forced Jayme to hide under a bed when he had friends over and penned her in with tote boxes and weights, warning that if she moved, “bad things could happen to her.” He also turned up the radio so visitors couldn’t hear her, according to the complaint. Authorities searched for Jayme for months and collected more than 3,500 tips. In January, she escaped when Patterson was away from the cabin and flagged down a woman who was walking her dog for help. Patterson was arrested minutes later. Since her escape, Jayme has been living with an aunt in Barron, out of public view but for a handful of pictures showing a smiling Jayme posted to the aunt’s Facebook page. Patterson wrote in his jailhouse letter to KARE-TV that he intended to plead guilty because he didn’t want Jayme’s family “to worry about a trial,” the station said.